Photo by MARK CHAMBERLIN The Exchange at Corn Hill recently opened in the former space of Nathaniel's Pub. The restaurant has a pub-centric menu that features (pictured) The New Yorker, a burger with corned beef, caramelized onions, bacon, Swiss cheese, and Thousand Island dressing. If you walk into The Exchange at Corn Hill (251 Exchange Boulevard) thinking it will just be a take on Nathaniel's Pub, the former occupant, only with new ownership, you would be mistaken. The space has undergone extensive renovations; managing partner Jeff Limuti is confident "you wouldn't even recognize it." Limuti — who also owns Brickwood Grill on Monroe Avenue — and partners Jimmy Wilmot, Alex Odenbach, and Tyler French opened The Exchange on April 7. Limuti wanted to open in a new, clean, space; a fresh start. The new bar and restaurant is a bit more upscale and family-friendly than Nathaniel's, with a menu that is pub-centric but uses local and fresh ingredients — the restaurant is working with local distributor Palmer's Direct to source higher quality goods. The Exchange also makes more items in-house. The restaurant is open for lunch and dinner, and the menu features an assortment of starters, salads, sandwiches, and entrees. The Pork Fingers ($8) and Chicken Tenders ($8) are both hand-breaded to order and the fries are all hand-cut. 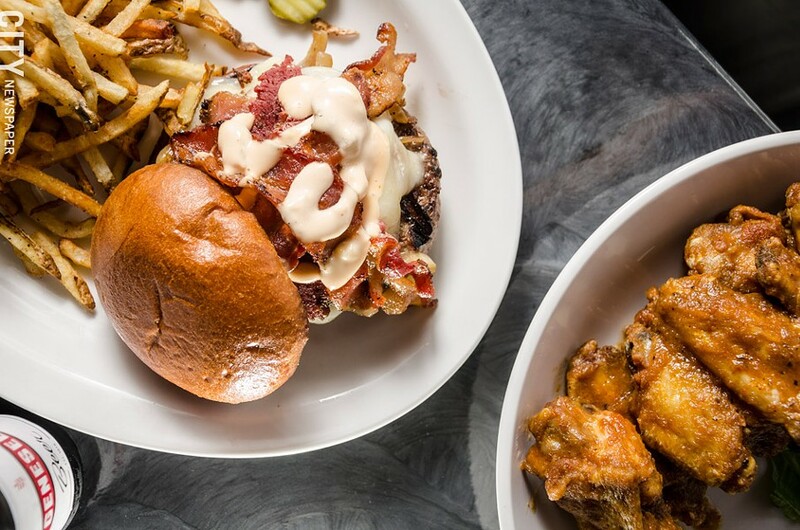 All of the burgers are made with Angus beef, and look for the New Yorker ($13), which adds corned beef, caramelized onions, bacon, Swiss cheese, and Thousand Island dressing. The menu's entrée selection includes mussels ($13) served in a garlic herb butter sauce, and a blackened mahi-mahi ($15) served with ginger slaw. Vegetarians can munch on the caprese flatbread pizza ($12), which uses fresh mozzarella, tomato, pesto, a balsamic glaze, and basil. It would be remiss of me not to mention the televisions: there are 21 of them. This a sports bar after all. The Exchange is a big supporter of women's soccer, and also hosts a Manchester United fan club to watch premier league soccer games. The bar has 24 draft beer lines, with selections from local breweries like Genesee, Naked Dove, and CB Craft Brewers. Limuti works with local charities to host events at Brickwood Grill, and he hopes to carry that tradition on at The Exchange. And Look out for bourbon and beer tasting events down the line. The Exchange at Corn Hill is located at 251 Exchange Boulevard. It is open Monday through Friday, 11 a.m. to 2 a.m.; Saturday from 12 p.m. to 2 a.m.; and Sunday, 12 p.m. to 12 a.m. 417-5623; exchangesportsbar.com. As the spring weather hits, soak up that Vitamin D while you can. The Food Truck Rodeo at the Public Market has kicked off its 2016 season, and the next one falls on Wednesday, May 25, with music from Fat City. All rodeos are held from 5 p.m. to 9 p.m. at the Rochester Public Market (280 North Union Street). More information at cityofrochester.gov/foodtruckrodeo. The next ZooBrew will be held on Friday, May 27, at 5:30 p.m. at the Seneca Park Zoo (2222 St. Paul Street). Tickets are $12 in advance and $15 at the gate. The 21-and-older event features beer, wine, food, and live music from Steve Grills and the Roadmasters, Roc City Paupers, and Third Degree. More information at senecaparkzoo.org/event/zoobrew. The patio parties at Casa Larga Vineyards & Winery (2287 Turk Hill Road) will start on Thursday, May 26, at 5:30 p.m. Held on Tuesday and Thursday evenings throughout the spring and summer, the events feature live music, local food trucks, and wine and beer offerings on the winery's front patio. Tickets are $10 and can be purchased at the door or online at casalarga.com. Blu Wolf Bistro (657 Park Avenue) will host a Naked Dove pairing dinner on Thursday, May 19, at 7 p.m. The four-course dinner will be paired with offerings from Naked Dove's catalogue of craft beer. Tickets are $35 in advance or $40 the day of, and can be purchased at Blu Wolf Bistro. bluwolfbistro.com. A Sonic Drive-In has opened in Henrietta at 945 Jefferson Road. Mamma Lucia (2500 East Avenue) has closed.